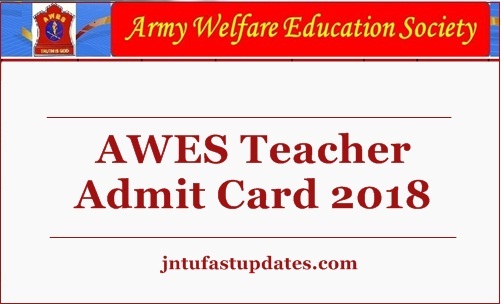 AWES APS Teacher Admit Card 2018: Army Welfare Education Society (AWES) is ahead to conduct the Army Public Schools TGT, PGT, and PRT examination 17th November and 18th November respectively. In order to attend the test applicants must download the admit cards from AWES Official portal, awesindia.com. The hall ticket link will be activated on the AWES official portal on 3rd November. By visiting the AWES alternative website aps-csb.in candidates can get the admit cards. Aspirants can download the exam call letter from either site. The hall ticket/admit card of the candidate will be verified by the examination officers before allowing the candidate to the examination. Hence the applicants must have to carry the admit cards to the examination without forgetting. Aspirants can check the details of AWES Teacher examination, admit card downloading process from this article. Army Welfare Education Society (AWES) is the Indian Army related organization. The organization especially works for the educational growth of children belongs to Indian Army personnel. The AWES recruit the suitable persons for Army Public Schools in various positions such as TGT (Trained Graduate Teachers), PGT (Post-graduate teacher), and PRT (Primary Teacher) posts. This year the AWES has advertised 8000 posts of TGT, PGT and PRT Vacancies. The AWES Official Notification B/45706/CSB-2018/AWES was advertised by the authority on its official portal. A huge number of aspirants having the suitable eligibility criteria have applied for AWES APS CSB Teacher Posts 2018. Candidates applied for the AWES Teacher posts will be shortlisted on the merit basis. Candidates have to qualify the written test and interview rounds with good merit to shortlist for the PGT, TGT, and PRT posts. All the applicants who have applied for the TGT, PGT and PRT Posts in AWES will have the written test on 17th and 18th November. The admit card/hall ticket will be made accessible on its official portal, aps-csb.in or awesindia.com on 3rd November, as per the organization detailed. Aspirants can download the hall ticket and take a printout of it to carry to the test. AWES Hall Ticket will contain the information of the examination venue, date, timings details. Along with the examination information, it also lists the candidate’s details such as name, register number, date of birth, and others. Applicants can go through all the details clearly once after downloading the admit cards. To avoid the unnecessary trouble of reaching late and missing the examination, candidates are informed to be in time. Report before 30 minutes of the examination to avoid the late reaching consequences. Also, carry any of the valid identity proof Xerox copy along with the admit cards. At the time of checking of the hall tickets, the examination officers may also check the candidate’s ‘identity cards. For any held regarding the spelling corrections and printing mistakes on admit cards, the competitors can approach the help desk numbers 26151564 & 26152642. Or on the email Id’s awesindia.com/ aps-csb.in. The organization will take the necessary steps accordingly. Visit the official of APS, aps-csb.in; Homepage is going to appear on the screen. Search for AWES TGT PRT PGT Admit Card 2018 and click on the link. Check the Examination venue, date, timings details from it and take a printout of it to refer it further.